Electric car maker Tesla (s TSLA) is racing toward building the world’s largest factory for lithium ion batteries. In the company’s earnings call on Wednesday, Tesla CEO Elon Musk said that Tesla plans to break ground on the factory in a still undetermined location as early as next month. In an unusual style, Tesla actually plans to break ground on at least two sites (maybe even three) in parallel until it ultimately chooses one. The list has been narrowed down to a handful of states in the southwest including Nevada, Arizona, New Mexico and Texas (that list also now includes California). Musk said Tesla would break ground on the second site a couple months after the first one. Why such a big rush? Tesla needs the battery factory to be able to produce enough batteries for 500,000 electric cars by 2020, including for Tesla’s third-generation lower cost electric car. If the factory isn’t ramped up at the same time as the ramp up of its third-gen car, it would be a big problem for Tesla. Production of Tesla’s cars is already constrained by battery supply. Tesla buys small-format lithium-ion batteries from Panasonic, and thousands of batteries are used in each Model S battery pack. On the earnings call this week Musk said that battery supply would constrain Model S production in the second quarter of this year, but would be relieved in the third quarter of this year. Worries about how battery constraints would hurt the development of the third-gen car are why Tesla is racing forward with the factory so fast and breaking ground on multiple locations. It’s a delicate dance of product launch and supply. If we don’t have the Gigafactory online when we have the vehicle capacity online, we will actually be in deep trouble, because we’ll have all the equipment and tooling and people for making cars, but not be able to produce the battery packs. Having to move so fast on such an unprecedented factory — the factory is supposed to double the current entire world’s lithium ion battery production — will be difficult and will take a lot of swift and creative thinking on Tesla’s part. Tesla already has an idea of how it would operate. The battery factory will be like “an industrial park under one roof,” said Musk on the call. Panasonic will likely produce the battery cells in the factory (Tesla now has a signed letter of intent from Panasonic), and then other companies would work in the factory and produce the anode, cathode, separators, and feed them to Panasonic. Tesla would produce the battery packs and be the landlord, said Musk. California is now a contender for the location of the battery factory, but Musk said California is an “improbable” choice. That’s because the state requires a lengthy process for approval of construction on new sites, and Tesla needs to act quickly. I have 320 acres between Mojave Airport and Hundai/Kia Race Testing TRACK. The other 600-700 acres is easily acquired by CASH…. So let’s get it done! Near the Mojave airport, Hundai/Kia Race/Testing Track & Honda Race/Testing Track! Near Edward Air Force Base 14/58 and near train tracks for fast shipping to Fremont. The City of California City can Approve Everything in 1-2 months with FAST CASH for the 1000 acres purchase. Power via wind and Solar is near by and the GRID is there! Come on Mr. Musk, keep the jobs in California and California City will do it cheap for you! No company with a brain would build in California. Their taxes will eat them up. Nevada is the place. What about Tesla service centers, they all eventually break/down. And warraty legal obligations Tesla will have to honor some how Legally, and service is more jobs ? “Tesla plans to break ground on the factory in a still undetermined location as early as next month…” That’s hardly “zooming ahead”. What will the TOTAL environmental impact be? Chemicals and the energy used to produce them ARE a grave concern, yet, the undereducated believes these are totally clean and exclusive to environmental impact…Au Contraire! Renewable resource in wind? I guess the dirty little secret is that the wind doesn’t always blow….and other resources are NECESSARY. THEN, just how do we DISPOSE all these batteries once they have served their lifespan? This is not a zero-sum game…there WILL be environmental concerns, just as much as carbon based fuels. Not sure why one of the initial experimental homes of Nikolai Tesla (i.e. Colorado Springs) isn’t one of the choices for the factory. Before moving forward on the building of a huge battery factory, you have to know what your competitors battery will be. If the competitors battery is superior, that factory could be all for nothing. I see Elon Musk as a gambler and it’s just a matter of time before he miscalculates and things will come tumbling down. No way would I buy Tesla stocks!! why lithium?!?!?!?!??! carbon foam capacitors are surely the future ?? Just considering, OSHA, and EPA, could end up being a nightmare. 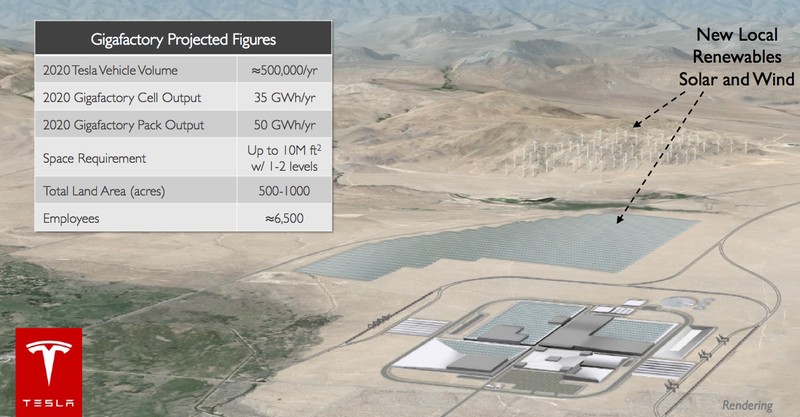 Maybe, Nevada, would be a good choice for a lithium Gigafactory. It could be built at the old atomic bomb test range! I’ll bet insurance companies are going to, NOT want to underwrite this little, I mean this Giga-Battery adventure. Can you say Workers Comp? I guess China or The Bikini Atoll, will be the best location for this Giga-Startup! Rather than build a battery factory, a better deal for Tesla’s growth and, therefore, shareholder value may be to expand the market for electric cars by putting the money into “supercharger” stations which enhance the value of the vehicle as something more than an urban novelty. Even then, it takes 40 minutes to recharge at “supercharger” stations in comparison with 5 minutes to refill a gas tank. @Jack, I think interstate driving with an electric car is the novelty. Urban driving is the perfect fit for an electric car. Most people I know with enough income for a Tesla Roadster or Model S only drive as far as the nearest airport — interstate driving is the exception. It’s still nice to have supercharger stations, but I doubt it should be Tesla’s highest priority. And in urban driving, charging is a non-issue, whether it be 40 min., 2 hours, or 5 hours. For me, even 5 minutes at the gas station is too much. Invariably, the pump is out of receipt paper, so I have to walk to the “convenience” store and either wait in line or rudely cut the line to ask for a receipt. Medieval! I was sorry to see “Better Place” go under. Their scheme was to standardize battery modules. You would roll in over a pit like an oil change place, and a robot would remove and replace a fully charged battery module from underneath in a couple minutes, much like loading a clip in a pistol. There is no way Tesla can build a $5 B battery factory AND build-out the “supercharger” stations, even after its successful convertible offering. The Company has only $2.6 B in cash (1Q2014) and, with GAAP income already negative, how can it finance the rest of the cost without incurring a serious negative cash flow situation? My guess (and that’s all it is) is that the only way a $5 B battery factor gets built is if Tesla goes into a strategic partnership with an existing manufacturer who has the money that Tesla lacks. My batteries are from CALB, yes from China. A123 was a US battery company but would not sell to me or any of my DIY friends after getting 249million of my tax money from DOE then another 250 Million from Stupid Wisconson which bought their crap. The ones I have now were made, like all of them were made, in Korea with Made in USA. Now they are owned by a Chinese company that bought it for 2 cemts on the dollar. But before going bankrupt the CEO would sell them to us for $60 each. We bought the same ones from China for $17. Of course that went to $32 after IMPORT TAX and shipping charges. Yeah still with the Made in USA sticker and all. Ahhhhh the way we do business here. Guess it is why EVERYTHING comes from China. Cam’t work as a Machinist anymore, no jobs. You can work but don’t be over 30 yo or ask for more than $10 hour. We did get the wages down though. NOW try to buy something. Anything that is not at wallmart. Great way for tax revenue to be collected. A123 is long gone after taking $10k of my money for a Prius plug-in conversion kit. After two years they left me an orphaned product with no service or warranty. Johnson Controls bought A123’s assets but not their liabilities. The “Mighty Mighty Prius” worked very well, I was getting 70 mpg pretty regularly. I suspect Toyota didn’t offer a Gen 3 plug-in due to these same battery availability issues. For fear of potential service nightmares, I ultimately dumped it for a 2013 Ford C-Max Energi plug-in hybrid. Nice car, but only a 45 mpg lifetime (40k miles) average. But $38k minus $5k “Ford family discount” minus $10k Fed/State tax credit, minus $9k trade in for the Prius was hard to pass up. They need Graphite to make these BATTERIES , the biggest deposit is in ALASKA! The Company is GRAPHITE ONE! Thw Company is GRAPHITE ONE! Good luck Tesla! Hopefully you will not set up in California….way too expensive and too many regulations. Tesla could very well to have the new factories in Japan, to be close to Panasonic, or in China, to lower the cost, but they choose to set them up in the US. Another point added to Tesla. I think Tesla will have sites in all the states mentioned. 500,000 cars by 2020 is probably a low number. Tesla will have to look at having 2million or higher cars in the years to come. Once the supercharging network is built up by 2015, then everyone will want a car that is electric and can use that supercharging network. Only Tesla cars will work on the supercharging network. Right now only the Model S can use supercharging. The roadster cannot use the superchargers. So what is the upshot? Demand will be very high in 2020 because the supercharger network will be built up and probably several gigafactories will need to be producing battery packs for the Model S, E and X. Where oh where is all the metals and chemicals gonna come from to make those batteries? That’s right it has to be mined out of the earth. Hope that doesn’t make all you lilly sniffers start having seizures. In the long run these have less environmental impact than coal, fracking, oil spills, nuclear waste. Not none, but less. Would anybody be surprised if somehow, some way, CA decides to power-walk approval for the gigafactory through the approval process? Musk is the man with “the” mission, no doubt about it. but danger lurks in the shadows ’cause the american auto industry is about to be pushed off to the side of the road, literally, and they won’t stand still while “mission-man” whirls about making lightening in a bottle. I think America’s future depends upon what happens, either way. Hey #Elon, why would you want to build a #Tesla battery factory in a state that wont let you sell your cars? #Texas? Seriously? Texas is gonna change the laws real soon. All auto manufacturers will be able to sell directly to consumers with no dealer needed. It isn’t just the battery factory, it is also the new launch facility for SpaceX that is on the line. Texas needs to get off the “pot” or get left behind. Texas has some of the best wind farm territory in the world. The problem is, it’s too far from the main grid and would take billions in new transmission lines to take advantage of. Using those windmills for this factory would solve that problem. And, it’s in the most desolate, cheapest land part of the country. Some useful info would be some description of the batteries used on gen 3. My understanding is current Tesla batteries are just a LOT of small lithium cells, like AA batteries, all joined together in a big clump. Do they have plans for larger battery cells, have they built and TESTED the new battery design, do they have a proven production process already running in some existing factories? I hope they’re not planning on using some new, untested design. All large batteries are made up of small cells. there is no “new battery design”. That’s not true, there are much larger cells available commercially. However, Tesla is using an “18650” cell because it was available in the quantities they needed, at least initially. It’s also easier to cool (the small size allows the coolant to pull heat out of the cell easily). They switched chemistries between the Roadster and the Model S, but it’s still the same size and shape cell, and cell voltage and current capability as well, just better performance. Wait. When this “gigafactory” was first announced Tesla Motors said that CA was not a contender. Now they say CA is among one possible sights but it is “improbable” due to CA having a long approval process. Then why even add CA to the list? My guess would be that for this project, CA will find a way to speed-walk the approval through the process. Why wouldn’t they (we)? Because when you tell a state you are thinking about spending $5B in their state they tend to cut corners to get approval done faster. You will find that when you are willing to throw money at a state and create jobs in their districts that politicians are just about willing to do anything. The factory will probably get any number of state tax breaks for the first 5 – 10 years of its operation. I wonder whether building a $5B factory won’t create even more problems for Tesla. It doesn’t make money today on a GAAP basis. Given that, how will they recover the cost of the new factory while building supercharger stations and trying to figure out how to make money in China? Seems like a real stretch to this energy guy. They really don’t need to make money right now. As long as they break even, the market capitalization will easily keep them afloat while they expand their operation at virtually light-speed. The fact that they’ve survived as long as they have, and they’re in the black, is utterly remarkable — nobody’s done that over ANY timeframe in the US automotive business in many decades. EPS is negative. P/E ratio is negative. They are not in the black by standard accounting procedures. Well thank goodness you reiterated the financials we’ve all read, Kevin. In that case, let’s just give up and go back to driving Hummers, since EPS, P/E ratio, and you- are so negative. Since when has Tesla made a dime. That is VoDo accounting that generated those so called profits. Plain nonsense, there just isn’t a market for an $80K car to invest that much that is needed for a battery powered car. Furthermore, A successful battery is not even in existence, let alone a high production battery. Im surprised that this car even got this far its certainly no engineering marvel as portrayed. Big publicity stunt from my point of view. Publicity stunt by whom? There is certainly a market for an $80k car or they wouldn’t be selling so many they can’t keep up with production. I hope Nevada gets this. We could use the boost in employment. Texas Nevada to much trouble. The whole state turns every week. Can’t wate for car sales out of factory instead of dealers. This will change the way every one buys cars. Just think no dealers any more. Factory direct sales I might have to get 2 of them. Indeed, this is the way the big three started, and most other industrial moguls, seizing an opportunity and capitalizing on it, too bad Cal. can’t react swiftly enough to matter. Did you mean to say cathode, and not catheter? Ha. Yes! Don’t know why I wrote catheter. Will fix.